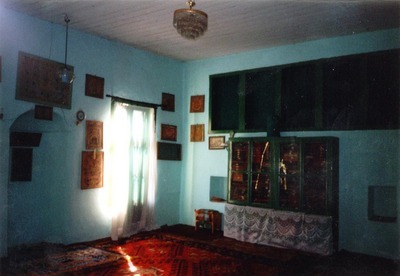 Interior of the Sheh Sezaj Qadiri Sufi teqe and mausoleum, Prishtina, Kosova – Photograph 2000 by Stephen Schwartz. During the last decade of the 20th century, every July 2nd [commemorating adoption of the Kosova Constitution in 1990] embodied the unity of the Kosovar Albanians. Despite ideologies or dogmas, all came together with a common goal and bore witness to their determination to achieve that goal despite all the sacrifices that might mean for them. This year, the 2nd of July finds Kosova in a miserable economic condition, with the results of an official census that is suspicious mathematically, to say the least, and following three bad reports in the previous week. The U.S. State Department named us as a location for human trafficking and prostitution; the World Bank said Kosova is an inappropriate country for investment; and Freedom House said the government of Kosova has failed to implement constitutional guarantees of freedom in media and continues to control the editorial policy of Radio-Television Kosova/RTK. Add to this a demonstration by some crazy Serbs, who besides insulting the Albanians (beginning with their parents and going forward), chanted slogans in support of Mladić and Karadzić. The worst, though, was yet to come. The most dangerous development, an effort to polarize Albanians on religious basis, was a demand for "the construction of a mosque in the center of Prishtina…"
"It is not right for Prishtina to have a [Catholic] Cathedral in its center without a mosque of the same size also in the center;"
"Some of the leaders of this movement/organization have connections to foreign services and this [pro-mosque] agitation is sponsored by Wahhabis/Russians;"
"Some people intend to present Kosova as a Catholic country when in fact it is Muslim;"
From what I have seen and heard these days I am inclined to believe that the demand to build a mosque in the center of the city is a direct response to the building of the Prishtina Cathedral across from the Faculty of Philosophy. It seems to be more a matter of spite than a rational appeal. I am even more convinced about the irrationality of this initiative by the demand to demolish the kindergarten across from the Faculty of Philology, so as to erect a very large mosque, but with the kindergarten and some stores then housed on the ground floor. That a preschool institution which should be secular will be incorporated in a place of worship seems not to bother those who have made the proposal. So, beside the 22 mosques currently functioning in Prishtina, a large one is required "in the center" because "there is not room enough for us all" – as if there could be a single mosque that would fit all the believers in one space. For the record, I have absolutely nothing against building places of worship. I have, however, a problem with the demolition of places of cultural and historical heritage to replace them with "missile-shaped" and similar buildings of dubious architecture. (The mosque at "Katër Llullat" was probably the oldest in Prishtina. They demolished it after the war and built a large mosque with many stores in the ground floor; the Hatunije Mosque was demolished and will be replaced by residential buildings). I have an even bigger problem when they level schools to build places of worship. There is no doubt that it was a bad precedent, which is now exploited by the "Join" movement, for the Prishtina Municipality to approve the request of President Ibrahim Rugova that the Cathedral be built in the place of the former Xhevdet Doda High School. The building once used for the high school could have been turned into a museum or into a new academic institution (it would have been in harmony with the University situated across from it or with the Opera House). [CIP Note: The Xhevdet Doda High School, named for an Albanian Partisan leader in the Second World War, was renovated after the 1998-99 war with financial assistance from the American Jewish Joint Distribution Committee.] Instead, they decided to tear down an academic structure and replace it with a religious temple. Kosova is defined as a secular state, but such decisions are the epitome of a misunderstanding of tolerance, and a political short-sightedness, that may cost Kosova a lot, after centuries of maintaining successful interfaith harmony by placing ethnicity first. The decision of the municipality was typical of the policies of Milošević during the occupation of Kosova – grabbing the space of an academic institution to turn it into a religious site, large enough to be seen from all the neighborhoods of Prishtina. Perhaps it is necessary to remind the protesters that the place that they are asking for (at the kindergarten by the Office of the Ombudsperson) is not exactly in "the center of Prishtina." And furthermore, that the center of Prishtina has three mosques already within a distance of 300 meters from each other: the Çarshia Mosque [the "Stone" Mosque or Kosova Mosque], the mosque by the National Museum, and the Fatih Mosque (known as the Grand Mosque or Imperial Mosque). They need to have it explained to them that no religious temple in the world can have enough space for all the praying believers, and that therefore, the argument of insufficient space is itself insufficient. They should also be reminded that Kosova was 80% illiterate at the end of the Second World War… Many people were killed and imprisoned because they fought for schools in Albanian… Today, when it is said that the level of illiteracy is 20 percent – very high for a country aspiring to join Europe – we cannot afford the "luxury" of replacing schools with places of worship. I am sure the religious institutions can be accommodated elsewhere. The most beautiful aspect of the long-suffering Kosova has been interfaith tolerance and the old saying: "The religion of the Albanian is Albanianism." Now we have some people who do not agree with it. However, it is still as meaningful as it was when it was first uttered, when our identity was questioned. It is absolutely in the interest of Kosova to defend the secular nature of its state, as defined by the Constitution, by respecting fully all internationally-accepted fundamental rights and freedoms. This implies the right to believe and practice religion, but not the right to impose it on others.